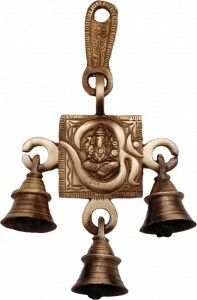 This Ganesha Bell hangs from brass hooks, and it is 6 inches tall. This Ganesha Bell can be used outdoors or indoors, so you can let the wind resonate the bell. 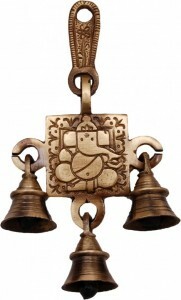 This particular Brass Ganesha Bell is made out of brass with an "antique" finish applied. Also, the bell is very clear sounding. Such bells can also be hanged at home and ringing of bells removes negative energy and brings positive energy at home.